Peel and core the Apples, being sure to remove any bruises or soft spots. Remove a small slice from the top and bottom so that they sit easily in the poaching liquid. Put wine, cider, nutmeg and the sugar in a 4 quart saucepan. Heat on high, stirring occasionally until the sugar is dissolved. Add the apples, and continue cooking until the liquid starts to bubble. Cover, and reduce the heat to medium low and simmer the apples for at least 20 minutes. The size of the apples will determine the actual cooking time. Check by piercing the apple with a fork. You want a firm but soft texture. When the apples are done, remove from the pan using a slotted spoon and set them aside. Remove all but 3/4 cup of the poaching liquid. Add the Balsamic Vinegar, Maple Syrup if using and the cinnamon. Heat on medium, stirring often until the liquid is reduced and syrupy. Add the butter and stir until the glaze is smooth and glossy. While the glaze is cooling, slice the apples into ½ to ¾ inch rings. 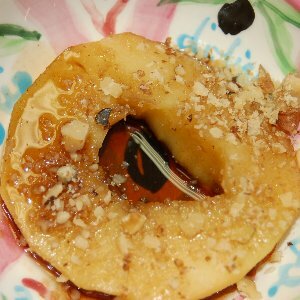 Serve by brushing the apple rings with the glaze and then a sprinkle of the walnuts. Here is another serving suggestion. Slice the apples in half lengthwise and place one half in a dessert dish. Place a small scoop of Vanilla ice cream over the apple half, and then top with the glaze and then the walnuts. Serve as a dessert, on the side or over top of grilled pork chops or pork tenderloin. Chop and serve over granola, muesli, or yogurt. Refrigerate for up to 4 days.